VRIENTS -Orbis terrae compendiosa descriptio. . .
VRIENTS, J.B. / PLANCIUS, P. - Orbis terrae compendiosa descriptio. . .
Orbis terrae compendiosa descriptio. . . - VRIENTS, J.B. / PLANCIUS, P.
Title : Orbis terrae compendiosa descriptio. . ..
Map maker : VRIENTS, J.B. / PLANCIUS, P.. Size : 15.6 x 22.6 inches. / 39.5 x 57.3 cm. Colouring : In attractive period correct colours. The map is a close copy of Plancius' separately published world map of 1594. The 1594 map became more widely available since after 1599 the copperplate was used in subsequence editions of the "Itenerario". When Claes published his first edition of the "Itenerario" in 1596 he included this map who is a close copy of Plancius' 1594 edition. This much rarer edition differences from the Plancius edition in the northern seas. The pictorial scenes forming the outer border have been regrouped with even greater stylistic effect. Below the double hemispheres Mexicana and Peruvana have been combined to form a single America, and the fictional Magellanica omitted in favor of a full-panel Africa. 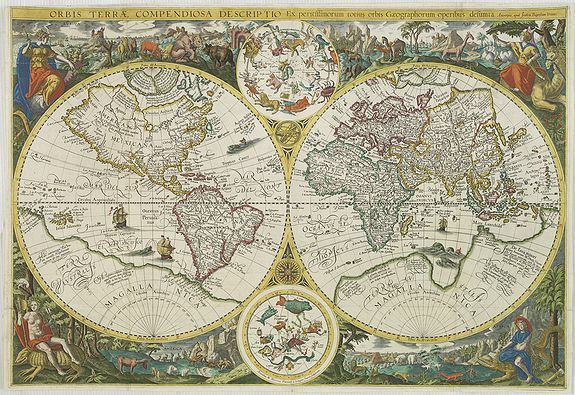 The overall engraving is much finer that that of the map engraved by Jan van Doetecum. The 1594 edition was published separately and no copies are known to exists; making this edition of Plancius world map the first obtainable map making reference to "Corea". Showing Korea as an peninsular. Linschoten had been in Portuguese service in the East Indies for nearly ten years. Jan Huygen van Linschoten lived since 1579 as a merchant in Spain and from 1583-1598 as secretary from the Portuguese archbishop in Goa. There he succeeded with the help of Dirck Gerritszoon Pomp, nicknamed "Dirck China " to retrieve the secret sail instructions, with the help of which the Portuguese ships sailed there from harbor to harbor. Pomp, a Hollander, also in the service of the Portuguese, went to sea in 1584 aboard the Portuguese vessel "Santa Cruz". The ship was richly laden with merchandise and had sailed by way of the trade-settlement in Goa, India, to Macao in China and from there to Japan. He arrived in Nagasaki in 1585, perhaps the first Hollander to set foot on Japanese territory. Dirck gave oral information to Jan van Linschoten. The Itenerario gives valuble information about Corea. He wrote: "so stretches the coast [from Japan] again to the north, recedes after that inward, northwest ward, to which Coast those from Japan trade with the Nation which is called Cooray, from which I have good, comprehensive and true information, as well as from the navigation to this Country, from the pilots, who investigated the situation there and sailed there." "From this corner from the bay of Nanquin 20 miles southeast onwards, there lay several islands with at the end, of which, to know, on the east side lies a very big and high island [This Island is] by many people inhabited, as well as on foot as on horseback. [sic!] These Islands are called by the Portuguese as Ylhas de Core, or the Islands of Core, but the islands, as previously described, is called Chausien, has from one side to the northwest a small indentation. The Vrients edition is also considerably rarer than its predecessor, receiving an R rating in Shirley. Although the two maps are very close geographically, they are far from identical. The Vrients added a crucial place name not found on the original "Banda" the island group in the East Indies that was the key source for the most sought after commodity of the age spices. Also, the mapping of Nova Zembla, the northern coast of Asia, and the North Sea are significantly different on the two maps. Both maps provided an up-to-date portrait of the world. Condition : Some very minor re-enforcement on crossings of old folds. Good and dark impression. On one place very small piece of paper thinness, re-inforced: hardly noticeable. Printed on heavy paper.